Harvesting a frosted crop brings another layer of complexity to an already busy time of year. Some of the complications are limited to this season’s harvest; whilst others have ramifications for next season’s crop. This article discusses some of these considerations for harvesting cereals and canola. Frost damage varies across the landscape in severity and scale in some areas. Better yielding paddocks and crops should be harvested first. Frosted crops are difficult to thresh due to higher residual sugars and lower grain volume. Despite lower tonnages, daily harvest maintenance and regular clean down remain important to minimise machinery fatigue and fire risk in these difficult harvesting conditions. Grain quality may also be compromised depending on the frost timing. 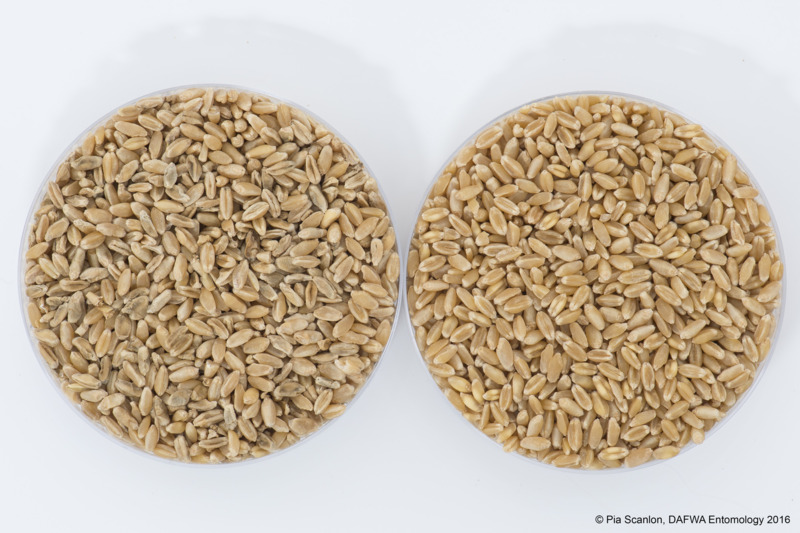 Frost affected grains usually have a lower hectolitre weight and higher screenings. Adjusting header settings and/or grading can be beneficial but check the feasibility first. Frosted stubble can rot off at ground level and be difficult to seed into. To minimise trash flow problems stubbles may have to be cut low. Given the residual nutrients in frosted crops there may be a risk of windrow effects. Evaluating weed seed burdens and wind erosion risk will help determine the best course of action. If keeping seed for next season, it is important to source seed from least-affected areas to maximise establishment. Seed quality can be tested closer to seeding by DPIRD Diagnostic Laboratory Services for a small charge. Canola has a greater capacity to recover from frost than cereals due to its indeterminate growth habit, however seed production can be severely affected, particularly if a frost occurs during the flowering to the clear watery stage (approximately 60% moisture). That being said, the effects of frost aren’t clear cut, as other environmental factors such as high temperatures will have a larger role in determining yield and quality. Overall management should not differ greatly from unfrosted canola crops but there are a few considerations to be aware of at harvest time. Frosted grain will be mushy or shrivelled, often the pods will have a scarred or blistered surface. Shrivelled seed may retain its green colour and affect oil quality. In severe frost events the developing seed will die, which turns into a mushy brown mass, drying to a small black or brown speck with poor oil quality. Growers are likely to see a reduction in yield where there has been a frost, however if not all pods and seed have been frosted then a favourable finish can allow for seed filling and often favourable oil production. Grading will remain important if keeping seed for next year. Where there has been a frost, seed is likely to be smaller which will make it challenging particularly in low rainfall areas where canola seed is often smaller. Mapping out the areas that were affected by frost will be useful information to help determine crop choice for subsequent seasons. Frost is difficult to manage. It has a significant economic and emotional impact on the whole community and it will be more important than ever to reach out and seek the support of family and friends this harvest season.